I have a confession: I am sometimes intimidated by talking to homeless people. I have never been one to enjoy talking to strangers on the street. (I have this thing about safety.) My husband is a magnet. I think because he’s such a kind-hearted person, people sense that. They can be clear across the street and dart over to us, wanting to talk to him. Not to me. To him. I, being the skeptic, am never quite sure of their stories. To be honest, there are many times I haven’t believed one word coming out of their mouths. I feel terrible admitting that. I haven’t minded helping them, but have tended to want it to be on “my terms.” Years ago, I spent some time volunteering in a soup kitchen. I enjoyed serving the food because I had a specific, helpful task. Yet, I found myself rather intimidated by the idea of having conversations. Week after week I started to recognize some of the regulars. I wondered about them and what brought them to this place of need. But I never found out. I just served the food and helped clean up. As the economy has gotten more challenging for many, I’ve begun to wonder about those “stereotypes” I believed. A dear friend of mine, Lana Shaw, shared her heart for one of the biggest lessons she’s learned in running a homeless ministry (SPEAK UP, http://speakupmag.org/). Lana shared that every homeless person has a story, and every story is different. There may be some who truly are just trying to get money so they can feed an addiction that put them on the streets to begin with. But that’s not everyone’s story. There are many who have heartbreaking circumstances that have brought them to this place, some of which was by no fault of their own. She said in hearing their stories, it’s clear this could happen to any of us. It made me think back to the time I lost almost everything I owned and was evacuated from the place I lived because of toxic mold. I was in the middle of writing my feature film, The Ultimate Gift. I had to start over in life. Thankfully, there were resources available (and a lot of friends and family) to help me start over again. But what if that help hadn’t been available to me? Could I have ended up like others who have landed on the streets? 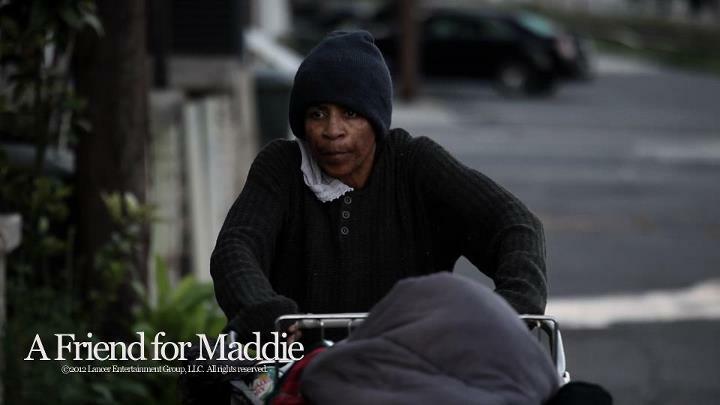 My new film project, A FRIEND FOR MADDIE, which shatters stereotypes of the homeless, has grown very dear to my heart. This is a story about a woman, Thea, who ends up homeless after tragic circumstances shatter her life. She crosses paths with a 10-year old girl, Maddie, who is also dealing with the pain of loss. Both of them need to find their voices again, and it’s through their unlikely friendship they find them. This movie, A Friend for Maddie, can do the same. It shows how every person has a story, even that person we may be tempted to avoid as they walk down the street pushing a shopping cart. That cart holds the last of their possessions. I was most intrigued by the last possessions of this character “Thea”. What she holds in that bag is key to who she was before she landed on the streets. Now when I see a homeless woman, I wonder: what has she chosen to hold onto? Or, what’s in that man’s bag that reveals his story? If you lost just about everything, all except one bag of belongings, what would you hold onto? If you feel so moved to help us bring this story to screen, let us know. One thing that truly excites me about this film is we want to partner with Lana’s ministry, Speak Up, and potentially employ the homeless people they have gotten to know, to be in the film when we shoot it. 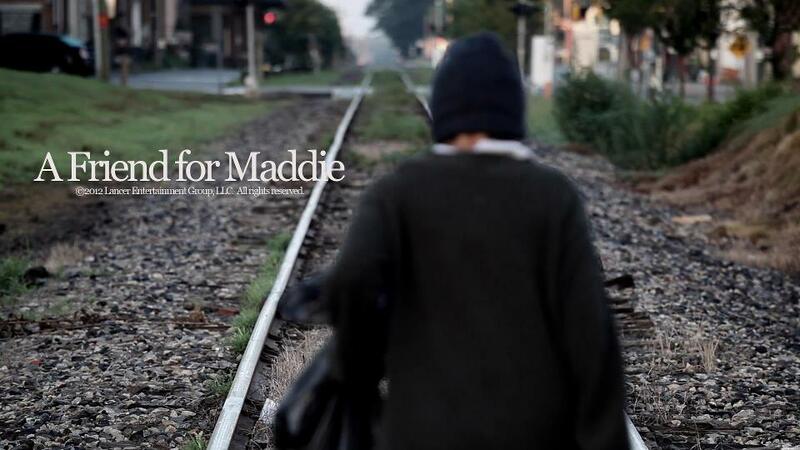 Speak Up is based in Charlotte, NC, where we hope to shoot A Friend for Maddie next year. They have just tapped Emmy winning director, Susan Rohrer, to direct the film. Thanks for your time and consideration. I’m honored to be a part of telling this story and coming to a deeper understanding of the journey of these people. I hope others will be touched by the story as well. A story that heralds true friendship, finding a voice, and sharing that voice with others.